The city of ’s-Hertogenbosch wants to have fewer cars in its city centre. To achieve that goal the city built a large car parking garage at the edge of the city, where people can transfer from their private car to a bus that takes them to the city centre. The city decided to build the so-called Transferium as green as possible in collaboration with a lot of stake holders. Cycling infrastructure is an integral part of the project. The building was opened last week with a bike-fest. Once the outside is covered in green ivy this parking garage will be hidden in plain sight with all the green surrounding it. In the distance to the right: the city hospital. In the far distance: the city. 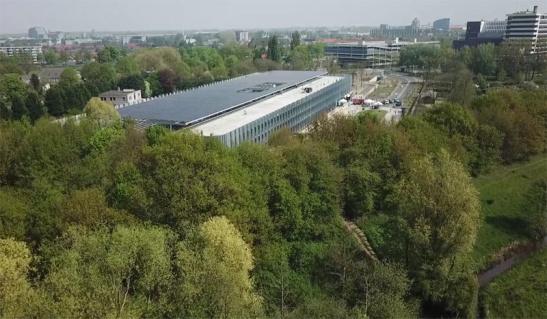 Still from a video by the city of ʼs-Hertogenbosch. Yes but whatever you call it its still a thumping great shed which you can see for miles. Cllr Rob Appleyard, Promoting and supporting Lambridge. 07527 577186 Members Advocate for the Vulnerable. Member of Banes Development control committee. Shadow Cabinet member for Economic Development. Charter Trustee of Bath. Member of Bath City Forum. Member of Avon Pension Fund Committee & Investment panel. The article goes into the design, the fact it will be covered in ivy etc. What’s more interesting is that within Bath, this idea of enabling people to park and then have really good cycle connections into the city is quite alien. Even Newbridge P&R with the perfect level access to the river path along Brassmill Lane has no direct traffic free access to it from the P&R.